Forex strategy by the method of Martingale, despite its deep history, still attracts participants of the international currency market. It causes such stormy interest because it guarantees a very high probability of obtaining the desired result in the form of earnings. But like all strategies, it has positive and negative points. The main drawback of this method is that to implement trading tactics, a trader should have a very impressive deposit amount: the more financial investments, the higher the chances of success. Historically, the method was first implemented in the casino: with the help of the technique, a win was made on roulette. But despite the connection with gambling, Martingale's forex strategy can be successfully used in stock trading. What is the meaning of this forex strategy? The main essence of the technique is to start trading with the lowest lot rate, and if it fails, the trader should increase the amount of the bet, so that he can cover the losses and make a profit. If the situation is winning, the player simply starts from scratch (the lowest position volume). At the second unsuccessful rate, it is necessary to increase the next volume of the position-to increase the next position to such a size that the trader can recoup and compensate all his past losses, cutting losses and thereby go into a plus. The strategy is cyclical: it happens until we win, that is, we do not make a profit. And then the trader again puts on the minimum volume and starts anew or he loses, losing all means and cracking off the deposit account with a crash. Here and the main negative side of Martingale's methodology is too high risk to lose all means (merge the deposit, increase the rate and get a low percentage of the game on the stock exchange). But despite the negative aspects, the strategic method is successfully implemented by investors and traders around the world. This is due to the fact that the main instruments of the currency market do not completely lose in price. This will be such a benefit for many. And of course, making transactions and concluding market transactions on the trend and successfully implementing the Martingale method on Forex, you can safely wait out the period of kickbacks, and then, go into a plus. Even if the trader goes against the trend, he has the opportunity to wait (Drawdown), and then start with a minimum loan to continue to earn. To successfully apply the Martingale method in the forex market, it is necessary to apply tactics trading on a trend or using a technique in a flat state. For example, the player analyzed the market, then classified the trend as an ascending one. After that, he opens a deal to buy (0,01 lot), using the orders Take Profit and Stop Loss 30 points. The price moves down, and the Stop Loss order is triggered: the player was prudent and to protect himself (or rather, the capital), puts a deferred order to buy a lot of 0.02. 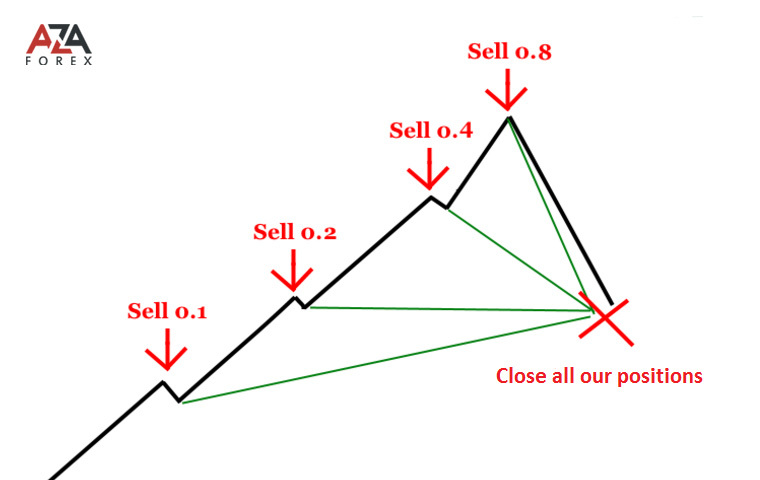 Oder - Stop Loss and Take Profit are similar to the first operation. Result: for the first operation we remained at a loss, but it was very successfully "repelled" by the profit in the second transaction. In reality, the entrance to the exchange is made on the basis of the average price: a pair of positions (consecutive) opens, while the volume increases gradually. The price on the market will not constantly move in only one direction, and after waiting for a tangible rollback, we will be able to recoup and get an income. But do not forget about strong moves against positions that are open. In modern forex trading, many advisors who perform calculations using the method, in an automatic mode, open and close all trading positions. The method itself has already been modified and improved due to various auxiliary means-indicators that predict the trend and facilitate calculations and analysis for traders. But at the same time, the sense of implementation of the method remained the same-the increase in the rate in case of loss. This strategy is relevant for traders who want to automate trade by simplifying its process (with the help of advisers). Experts recommend using this strategy in combination with others for greater efficiency (and minimizing the risk of losing funds). If you enter the trend and at the same time apply a positive swap, the results will be very effective.